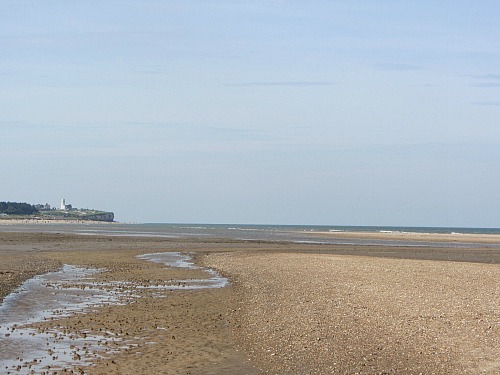 Holme beach is one of those beaches that very few people know about. That’s great news for you as it means that even in the height of the holiday season, it’s pretty much empty. And just because I’ve given away a secret here, believe me when I say it will always remain like that because there are many other people that prefer the busier adjacent beaches of Hunstanton or the huge open expanse of beach at Old Hunstanton. 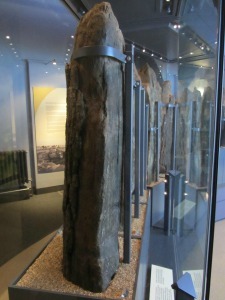 Holme beach came to prominence in 1998 with the historical discovery of Seahenge, a 4000 year old Bronze Age timber circle which was eventually excavated, restored and can now be seen at Lynn Museum in Kings Lynn. It's a fascinating story and very much part of Norfolk's history. To get to the beach you need to look out for the sign on the main A149 which takes you down a narrow lane (Beach Road) all the way to the golf course at the end. It’s just west of Holme-next-the-Sea village. There’s lots of parking spaces available in a car park on the right hand side (£3.50 for the day). 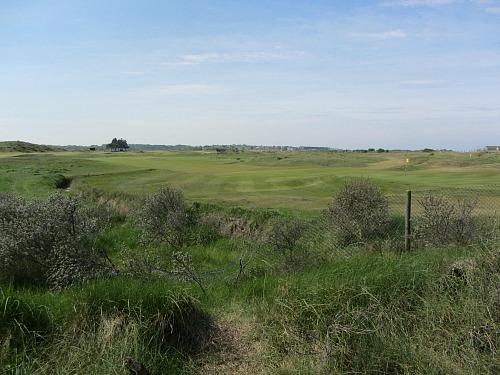 You then have a very pleasant walk over the golf course, and over the sand dunes to finally arrive at the beach. It’s not far, but would be slightly difficult for pushchairs as there are no board walks, but its certainly not impossible, and the compacted paths make it a bit easier for you. look left and you’ll see as far as the old white lighthouse of Hunstanton, and the colourful cliffs and beach in the distance. Turn your head to the right and all you’ll see is sky and sand. 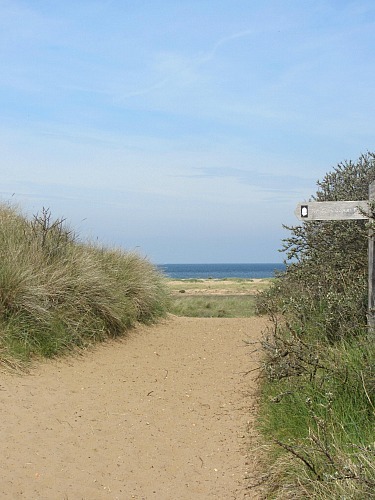 Look behind you and you’ll be faced with wild open feel of Holme Dunes Nature Reserve. When the tide is in, you’ll be able to walk on the soft sand interspersed with pebbles, but it’s not unpleasant at all. I certainly wouldn’t call it a stony beach, unlike Cley which is completely pebbled, but it’s not pure golden sand like Holkham beach either! 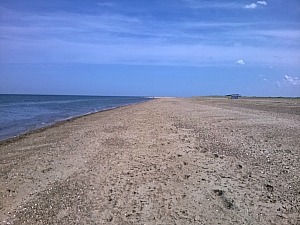 And when the tide is out, you have the wonderful hard sand that is typical of many of the Norfolk beaches, perfect for building sandcastles or playing cricket. Holme beach is where the Peddars Way ends its journey. It’s also where the Norfolk Coast Path crosses, and if you’re interested in walking either of these trails, then this fantastic book is definitely worth purchasing. It is so well set out, giving you excellent detailed maps of the paths, and suggestions for eating etc. A really easy book to follow. I’ve got it, and use it a lot. And if you're interested in walking both these stunning and historic national trails with Explore Norfolk UK's walking holidays, you'll find much more details on both these paths here. This is definitely a wonderful dog friendly beach as there are no restrictions at all. And if you’ve got a sociable dog, you’re guaranteed to meet some friends! 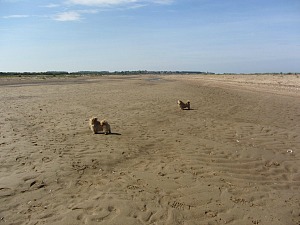 Here are my two very shaggy Norwich Terriers enjoying the mud flat before heading over towards the beach! 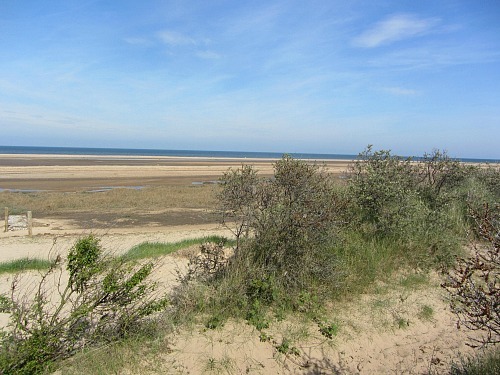 However, if you decide to walk along part of the Norfolk Coast Path, which takes you alongside the golf course towards Thornham, then please be aware that this is the NWT Holme Dunes Nature Reserve so they will need to be kept under control. Even if you don’t have dogs, you can walk for miles either way. You can walk west along the beach all the way to Snettisham, and if you walk east, you can follow the Norfolk Coast Path which would eventually take you all the way to Sea Palling! Obviously not all of that would be on the beach though as much of it comprises salt marshes, harbours etc. But it’s a most fantastic walk. If you're thinking about staying in this area and would like very dog friendly relaxed pubs, then The Lifeboat Inn and The Chequers Inn will be perfect. Very close to Thornham Marshes and the Norfolk Coast Path. This is a really uncommercial beach, there are no attractions whatsoever anywhere near the sand which for some of you is just what you want. The only refreshments available are from the little kiosk in the car park where you can purchase ice creams, tea or coffee and even grab a little dog treat as well. So it’s best to bring your picnic and chair and just enjoy your day with all your personal choice of little goodies! There is also a W.C. in the car park. For those lovers of golf, this beach sits on the edge of Hunstanton golf course, one of the top 100 golf courses in Britain and Ireland. So you have wonderful scenery, making it an extremely attractive golf course to play on, and some of it passes by this lovely unspoilt beach. You're also extremely close to The Lodge Inn in Old Hunstanton which is an excellent dog friendly pub to enjoy a meal in, or stay at. All I have left to say is Holme beach really is one of Norfolk’s gems. 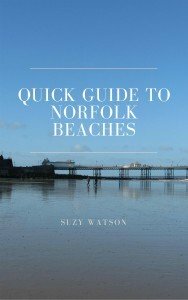 There's much more information on all the other Norfolk beaches here.